Wishing everyone a safe and happy New Year. May it be filled with love, peace and piecing. I have been off the air for a week enjoying Christmas with my very large and crazy family in Sydney. No PC, no sewing machine, no fabric ( except for my Spotlight Sale purchase ). I had to stare at this is all day. I have just arrived back to Brisbane on a 7am New Years Day flight ( Yawn ) to be greeted by the beautiful Queensland sunshine. I have big plans for 2012. Lots of quilts (specially UFO’s), publications, blocks, tutorials, giveaways and quiltalising (socialising with quilters). What do you have planned? To kick off the New Year I will announce the winner of the California Girl Layer Cake. 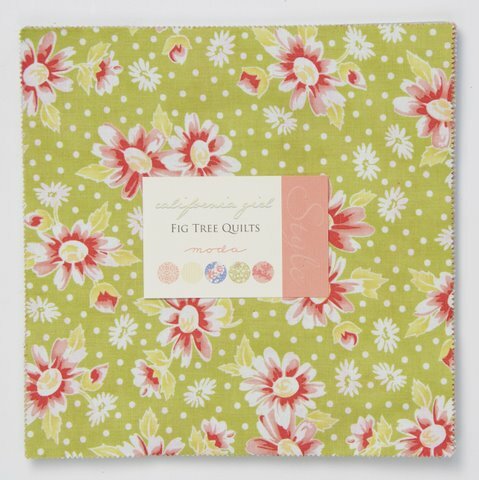 The winner of this luscious new collection from Fig Tree Quilts for Moda had to guess my favourite food, colour and country. I LOVE LOVE LOVE tomatoes even though I talk about chocolate all the time. I eat them every day with cracked pepper and sea salt. While I lived in France for a year, I did travel to Turkey and it became one of my favourite foreign countries and Turquoise reminds me of the sea of Turkey and the bay I group up on. I like to place a splash of Turquoise in most of my quilts. This month I will be offering something BIG in the giveaway stakes. Make sure you visit over the next few days to see what is being offered. Until then, stay safe and enjoy this glorious new year. P.S Until 7th Jan 2012 midnight I have 10% of all Jelly Rolls in my little e-shop. Just enter 10JELLY at check-out. Thank you for your giveaway, and I am sew privileged to be the winner! WOW! I can't wait to start on a project with this layer cake! What a lovely view you had in Sydney. Could you see the fireworks from there? I can't wait to see you do this year!! Wow – if I had that view for a week, I would probably be okay without fabric. Happy New Year! Hi. I just had a look at the view at the top of your post and I think I may know your Sydney family. I am very familiar with that view. Were you in Cammeray? Glad you had a lovely break but it's wonderful to have you back. Happy New Year Jane. Hugs, Sandy. I received the layer cake today. The mailman got through the snow today and delivered the package. Thank you so much, Jane! It is beautiful! Stop by my blog to see what I create with it!